I’m a news junkie. I read it online. I watch it on TV. I listen to it on the radio. I pull it up using apps that I downloaded onto my cell phone. I can’t help it, I like being informed. I think my love for “the news” is rooted in grade school. Each week, we had an assignment called “Current Events”. It was a combined composition and social studies assignment that was designed to teach us to look for the five W’s: who, what, when, where, why. Sometimes, we were on the lookout for “how”. The social studies aspect helped us to know what was going on in the world around us. In addition to being assigned to watch the news on television (gasp! 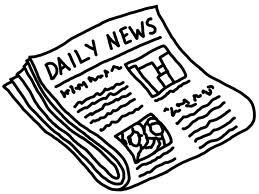 ), the assignment required us to convince our parents to subscribe to the local newspaper, if they didn’t already get it, and cut out stories of interest to share with our classmates. So, a headline that read “Hospital to Expand“, would prompt us to explain the five W’s about the expansion. Who were the key players in the story? What was the main idea of the article? When was the work scheduled to begin/end? Where was the hospital located? Why was an expansion needed. I loved finding out the answers to “why”, so this wasn’t work for me – this was fun! The downside to this assignment is something that prevented me from allowing my children to watch the news when they were younger. I wanted to protect them from being exposed to stories such as bank robberies, homicides, neglect, rapes, whatever the horrible stories of the day were. I wanted them to remain oblivious to the ills of the world for a little while longer. I didn’t want them to fear the world and become worrisome about stepping outside of the walls of the home that kept them safe. They’re much older now, so with parental guidance, I will allow them to watch clips of the local news, but it’s still a rare occurrence, because the local news seems bent on reporting the worst of the worst. For my own sanity, I made the conscious decision to obtain the bulk of my television news from a local station that still reports horrible news stories, but finds the time to tell stories that are heartwarming and provide demonstrations about mundane things like cooking and gardening. I’ve come a long way in that the lenses from which I view the news these days are stamped with compassion. I began soaking in current events because of grade school, but over time, I developed a sometimes twisted habit of laughing at the suffering of others. Today, I am thankful that I can now view the news through God’s eyes to some extent. Instead of laughing at the mugshot of an intoxicated woman dressed a cow, I now bow my head and pray immediately for God to deliver her from the evils in her life. When I catch myself laughing at someone else’s suffering, I pray for God to change that behavior and allow me to see the world from His eyes to an even greater extent than He’s already gifted me. Thank you for giving me a snapshot of how You view the world. Help me to discern the needs of others and to intercede on their behalf in prayer. I pray that my children will also be given the same gift of compassion for others, so that they will be able to show a Christ-like love to friends, family, and strangers. I pray these things in Jesus’ name, Amen!